Keep the party popping. The H-D® Metallic Flames Popcorn Machine has a side-hinged 4oz kettle that pops 92 1-ounce servings per hour behind frosted Bar & Shield detailed smoked glass panels. 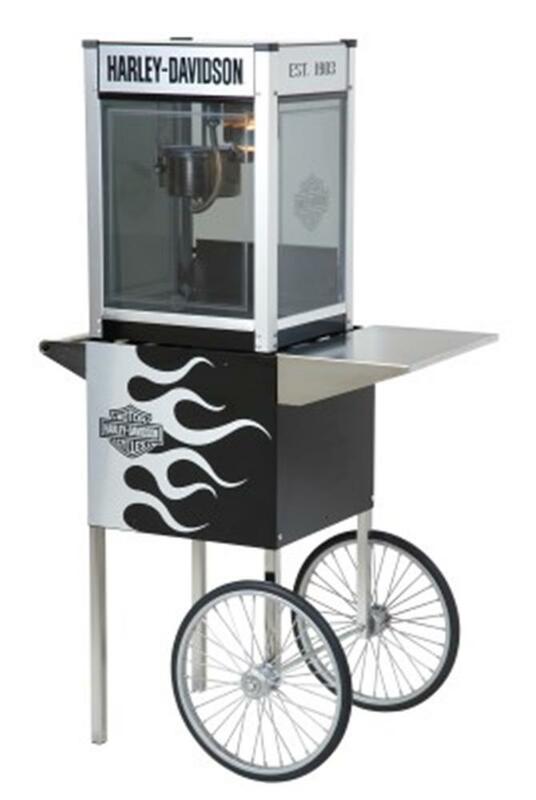 The popcorn machine sits in the matching black cart with custom cut brushed metallic flames and the H-D® logo. Rolls on black rubber wheels and features a convenient chrome service shelf and handle. Easy assembly of cart required. Made in the USA. Popcorn machine measures 16.5" W x 23.5" H x 14.5" D. Cart is 17" W x 33" H x 17" D.
This item weighs approximately 96lbs and will have to be shipped via truck freight direct to your doorstep.